I am pretty sure that Ali of Something this Foggy day will like this (she is always posted quite amazing crochet decorations and creations). Not sure I have ever seen her post a helmet and beard done by crochet. Created using the finest mithril threads, it’s a crochet helm! 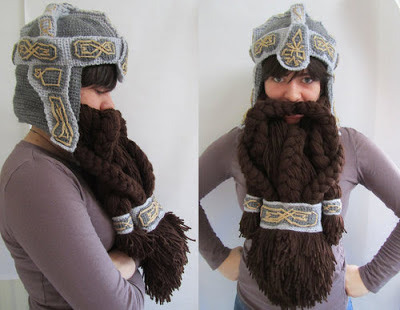 It’s a crochet beard! It’s a combination crochet helm and beard! Blessed by the gods with the finest of man-garnishes on my own face, I have no need for such a garment, but if you wish to assimilate into dwarven culture you might want to quest for one.